I’ve made a lot of chocolate cakes over the years. A lot of chocolate cakes. 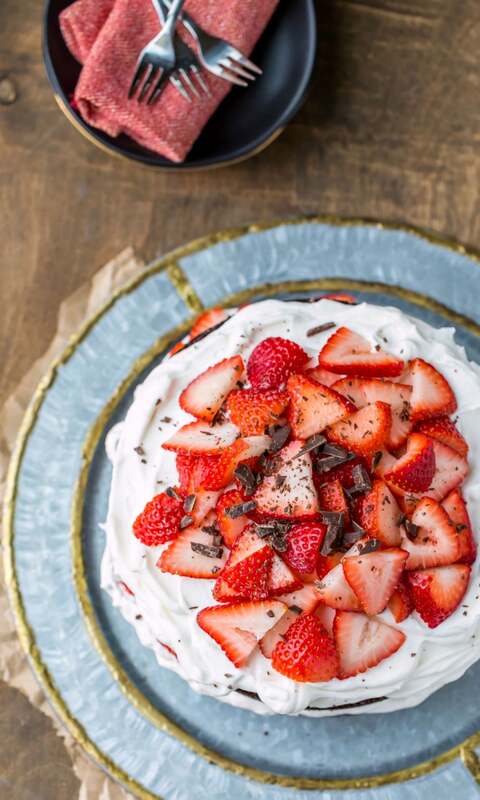 But this strawberries and cream chocolate cake is one of my favorites. The chocolate cake tastes like a cross between brownies and chocolate cake. It’s a little richer and a little more dense than a regular light and fluffy chocolate cake. 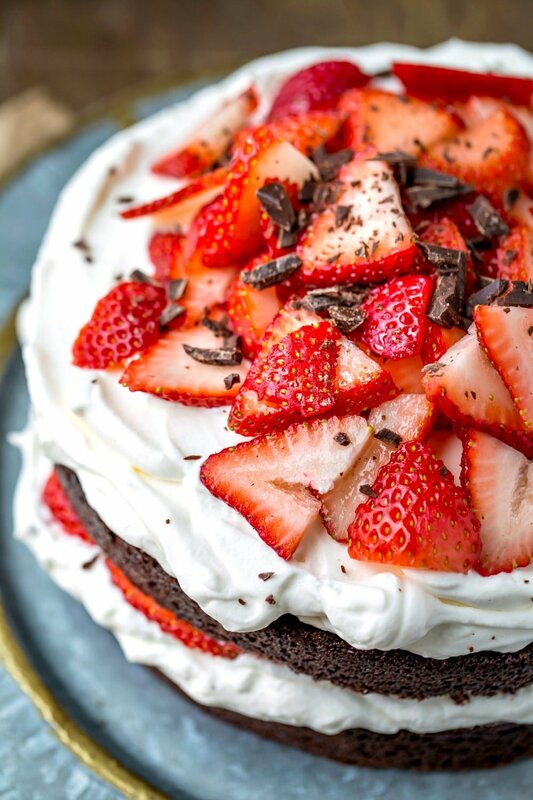 The chocolate cake is topped with plenty of sweetened whipped cream and fresh strawberries. 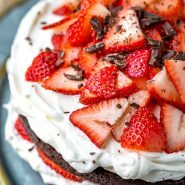 The sweet/tart strawberries and the creamy whipped cream are pretty much perfect with the rich chocolate cake. 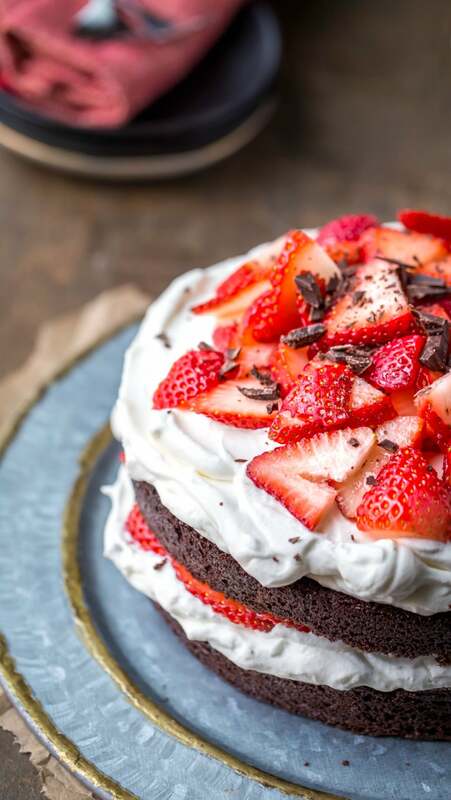 If you’ve tried this strawberries and cream chocolate cake recipe, don’t forget to rate the recipe and leave me a comment below. I love to hear from people who’ve made my recipes! You can SUBSCRIBE to receive my latest recipe newsletters or FOLLOW ME on FACEBOOK, INSTAGRAM and PINTEREST for even more delicious food. In a medium bowl, whisk together the flour, cocoa powder, baking soda, baking powder, and salt. In a separate large bowl, whisk together the sugar, melted butter, eggs, and vanilla. Whisk the flour mixture into the sugar mixture along with the buttermilk and warm water. Bake until a toothpick inserted into the center comes out with just a few moist crumbs attached, about 40 minutes. Transfer to a rack to cool for 20 minutes, then loosen cake and flip out onto the rack to cool completely. To put it all together, beat heavy cream to soft peak stage. Add sugar and vanilla extract, and continue beating to form stiff peaks. Top bottom half of cake with 1/3 whipped cream. 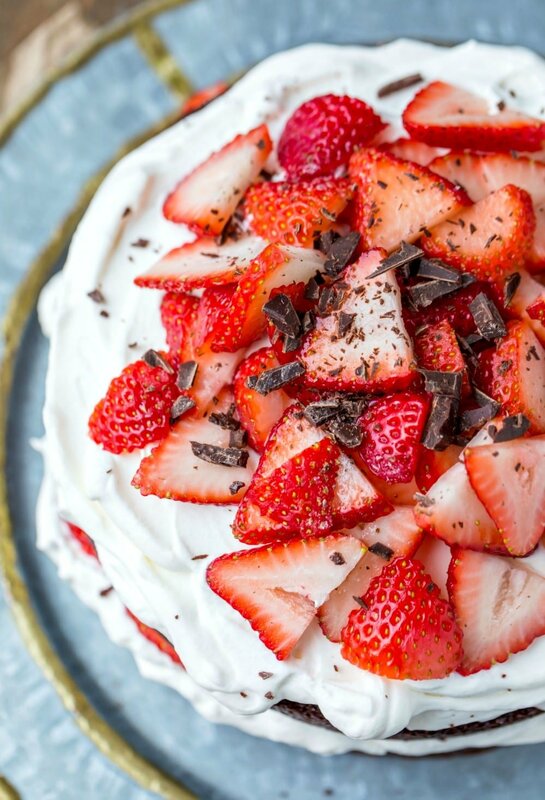 Lay a single layer of strawberries over whipped cream. Replace top layer of cake, and top with remaining whipped cream and strawberries. Cover, and chill any leftovers. I seriously like this cake very much, looks absolutely fantastic and there’s no doubt of a delicious taste. Love the presentation too & looks terrific !!! This cake will make a success on my 37th birthday party. What a beautiful and tasty cake. Ok I don’t leave reviews on websites but this cake was that good! This is going to be my new go to recipe. Thanks! So glad you liked it! Thanks for taking the time to come back and comment!